The Unemployment Insurance Advisement of Benefit Rights is an unemployment law poster by the Nebraska Department Of Labor. This is an optional poster, so while it is recommended that you post this if it is relevant to your employees, you are not required to by the Department Of Labor. This poster is optional to post and describes who qualifies for unemployment benefits and how to apply for these benefits. NE All-In-One Labor Poster: Instead of printing out dozens of posters, employers can also purchase an all-in-one poster that covers both Nebraska and Federal poster requirements by clicking here . It appears you don't have a PDF plugin for this browser. Please see the link below to download nebraska-ui-advisement-of-benefit-rights.pdf. shall provide such information as required on the application. handwritten on a form prescribed by the Commissioner. accordance with 219 NAC 4.
year which includes the greater part of such week. though benefits are not payable for that week. which he/she reports to the Department. 008. Weeks of disqualification assessed pursuant to Neb. Rev. Stat. §48-628 and reductions in benefits determined pursuant to Neb. There are an additional seven optional and mandatory Nebraska labor law posters that may be relevant to your business. Be sure to also print all relevant state labor law posters, as well as all mandatory federal labor law posters. 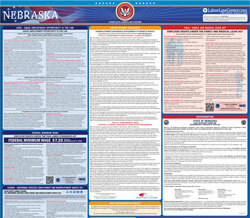 Instead of printing out pages of mandatory Nebraska and Federal labor law posters, you can purchase a professional, laminated all-in-one labor law poster that guarantees compliance with all Nebraska and federal posting requirements. Fully updated for 2019! While we do our best to keep our list of Nebraska labor law posters up to date and complete, we cannot be held liable for errors or omissions. Is the poster on this page out-of-date or not working? Please let us know and we will fix it ASAP. LaborPosters.org will email you a printable PDF of this Nebraska labor law poster, 100% FREE. You'll also get notified when new posters are available. Your Nebraska poster has been downloaded and emailed! This poster download is provided as-is, with no warranty or guarantees. Please verify with Federal and Nebraska authorities to confirm that you are posting all of the correct (and updated) posters required for your type of business. If you want to ensure that the posters you display are complete and up-to-date, we recommend a professional all-in-one poster with a compliance guarantee. Instead of printing out pages of mandatory Nebraska and Federal labor law posters, you can purchase a professional, laminated all-in-one labor poster. All-in-one labor law posters contain the latest version of every federal and state poster you need to guarantee compliance with all posting requirements. This poster is professionally designed and laminated, and will protect employers from posting fines and employee disputes. Fully updated for 2018.